These days, there is no denying the role or the importance of social media in digital marketing. In fact, it has become crucial to online success. This has been mainly due to its ability to generate traffic which is as good as search engine results. However, for many companies, social media is used for more than just traffic generation. Customer engagement has become just an important objective of social media. 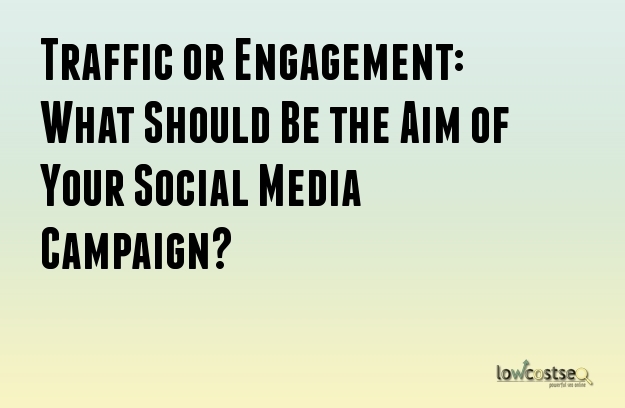 As a result, many companies are now wondering whether the focus of their social media activities should be to generate traffic or engage with their audience. On the other hand, it is becoming clearer that it is possible to generate more traffic if social media is used for audience engagement. Here are some of the reasons why this is the case. It is important that you understand the ROI of your social media activities and track your success before proceeding further. The important thing to note is that the metrics can differ between businesses, niches and industries. You need to find out which one suits your needs. For example, the measurement of your social success can be an increase in website visits or sales. Lead generation or conversion can be other options. Irrespective of the Social ROI chosen as your metric, the fact remains that the level of audience engagement will affect it. In other words, an improvement of audience engagement can lead to higher success. The engagement level of your audience depends greatly on the quality of the content you are using as well as its effectiveness. Your content must be good enough to capture the interest of the target audience. As a result, you need to think about the content type and how well they were created. Once you have managed to engage with audience, they are certain to keep visiting in order to get more of your great content. This results in an increase of traffic generation. While content plays an important role, it is by no means the only way to improve engagement. There are quite a few strategies and tips for doing so. Here are some of the more effective ones. High Conversion Keywords: It is possible to create more interaction by using certain keywords. These sets of keywords vary between different social media networks. Words like ‘inspire’, ‘where’, ‘when’, ‘discount’, ‘deals’, ‘discover’ and ‘check out’ can increase the engagement level greatly. Hashtag Use: Hashtags have become an essential part of the social media experience. They are also very effective in the generation of engagement and, as a result, traffic. Various statistics have already determined the efficiency of these elements. For example, hashtags in Twitter double engagement generation. Visual Content: Visuals play a pivotal role in social media as people are attracted to such content naturally. That is why Pinterest has become very popular. Make sure that you add visual content such as images, gifs and videos to your posts to improve engagement.